I’ll schedule this post for Monday, the day I return to the UK at the end of my stay in Japan. This is it; I’ve had plenty of ideas for things to write about, but I won’t add any more after this. I had no idea when Rebecca set up my blog that I’d end up writing so many entries, and posting so many photos. I’ve very much enjoyed the whole process of photographing and writing about the things I see around me and the things I’ve done. I’ve had some kind comments about my blog from lots of different people, and it’s good to know that friends and family have enjoyed it. I have many people to be very grateful to, people who have made my time in Japan possible and enjoyable. But I’m also looking forward to getting back to normal and taking advantage of whatever opportunities I’ll have in the future. Arigatou gozaimashita. Thank you very much. I wrote on Tuesday about the storm that came through. It was the worst storm for decades, bringing typhoon-strength winds to western Honshu. Train services were brought to a halt, flights were cancelled and four people died as a result. Given all that, maybe it’s just as well that the sakura is late this year; who knows what the storm would have done to the blossom. There were clear blue skies on Wednesday morning and the cherry trees around Nakamachidai have suddenly blossomed in the last few days. There are now trees everywhere with a dense covering of white or pink. I have not yet observed the Japanese custom of hanami. 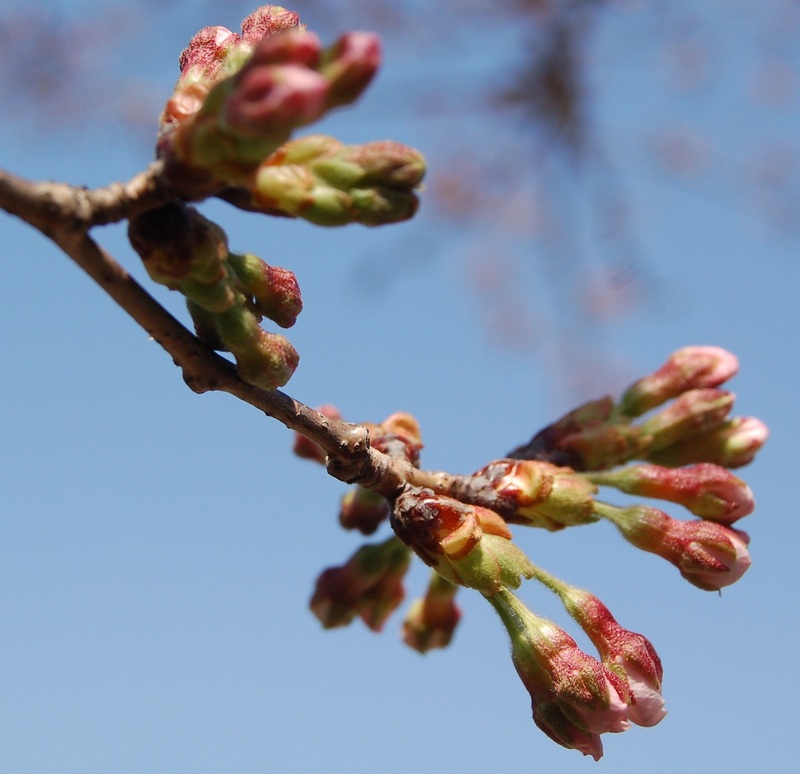 Generically, it means flower viewing but it usually refers to viewing cherry blossoms. There’s even a term for viewing the cherry blossoms at night, yozakura. Hanami and yozakura both involve sitting under the sakura with a picnic and sake. I wrote a while ago about purification with water, and I said that fire was another method of purification. In my experience, a basin of water is common near the entrance to shrines but a container with smoldering incense sticks is much less common; only the larger temples have this. My original post was about the importance of purification to Shinto, but purification with fire is important in Buddhism, too. 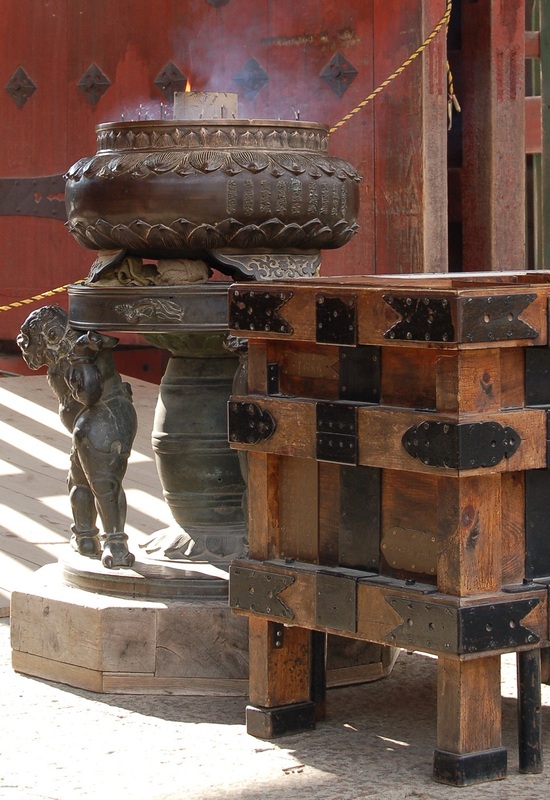 Both of these photos are taken at Buddhist temples. The photo above was taken in front of the Kamakura Daibutsu, or big Buddha. The vessel is a little unusual, as it’s enclosed with two holes rather than being open-topped. 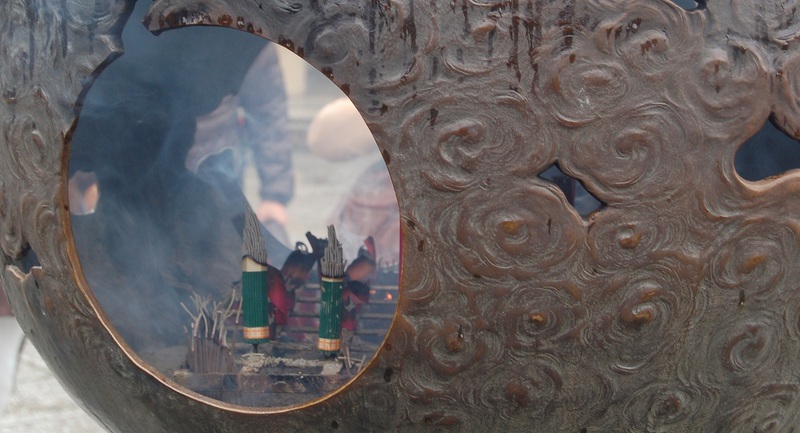 The process is the same; people put lighted incense sticks inside the vessel and draw smoke onto their head or other parts of their body with their hands. The photo on the left was taken in Nara when Edward and I were there in December. 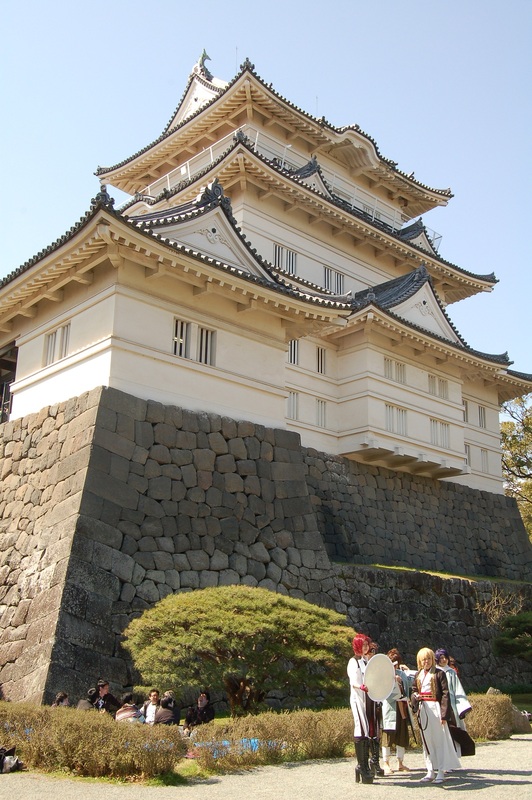 I don’t know if anyone noticed the group of people in the photo of Odawara Castle in my last post, including the girl with the red hair, high boots, and strange clothes. 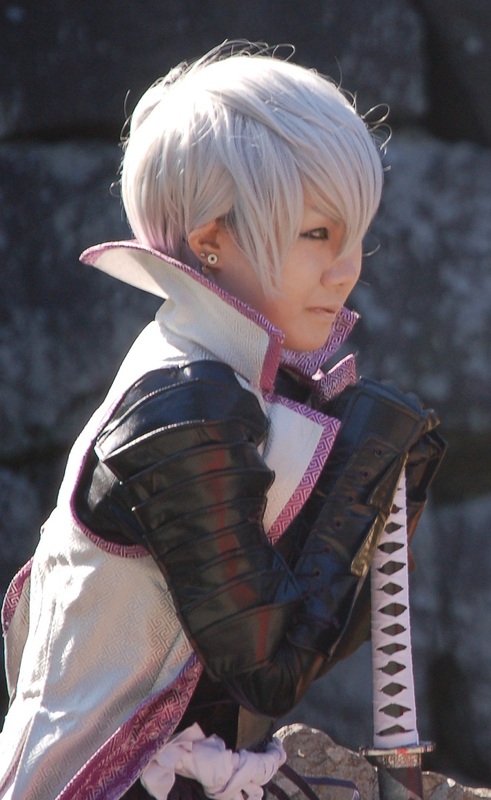 Well, I became aware of groups of similarly-clad young people making their way towards the castle as we approached on Sunday; this is cosplay, a Japanese speciality in which people create a virtual world. 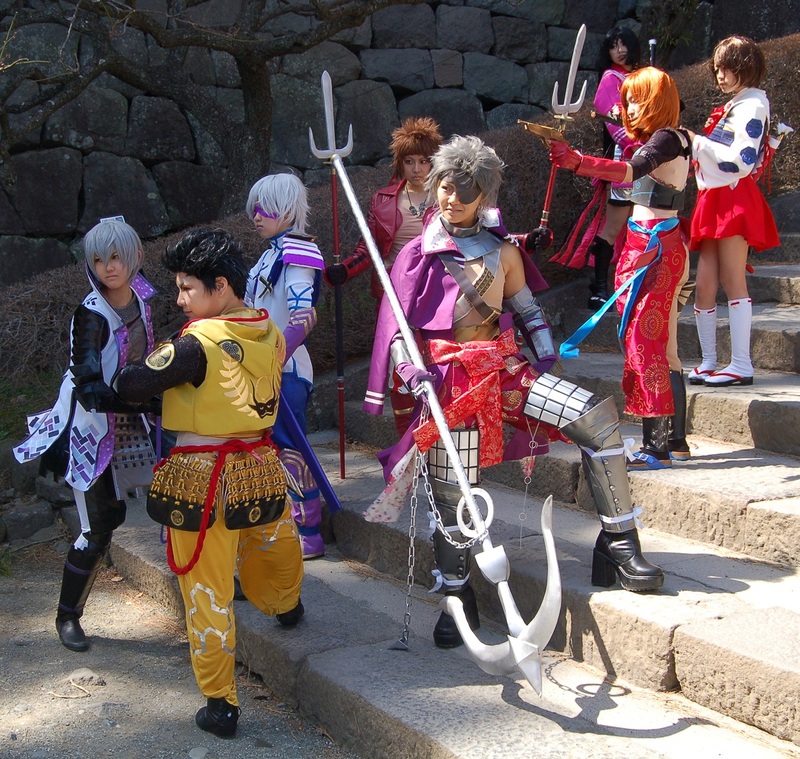 At the foot of the main castle building and elsewhere in the castle grounds, groups of young people, dressed in all sorts of costumes, were striking different poses, while their friends captured it all on camera. These costumes must have taken ages to create – I’m sure that’s all part of it, letting your imagination run free, unconstrained, in an attempt to define an alternative identity for a Sunday afternoon. 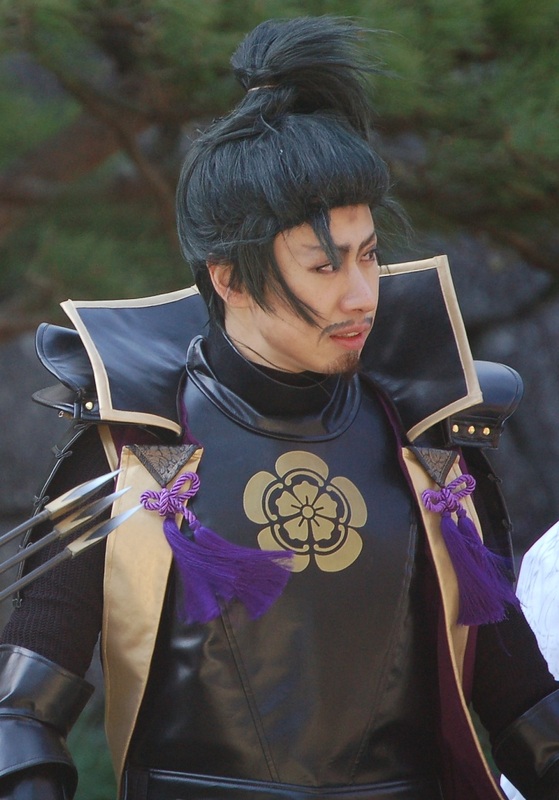 Perhaps some of the ideas are based on historical reality but, unless I’ve seriously misunderstood Japanese history, most of it’s pure fantasy. 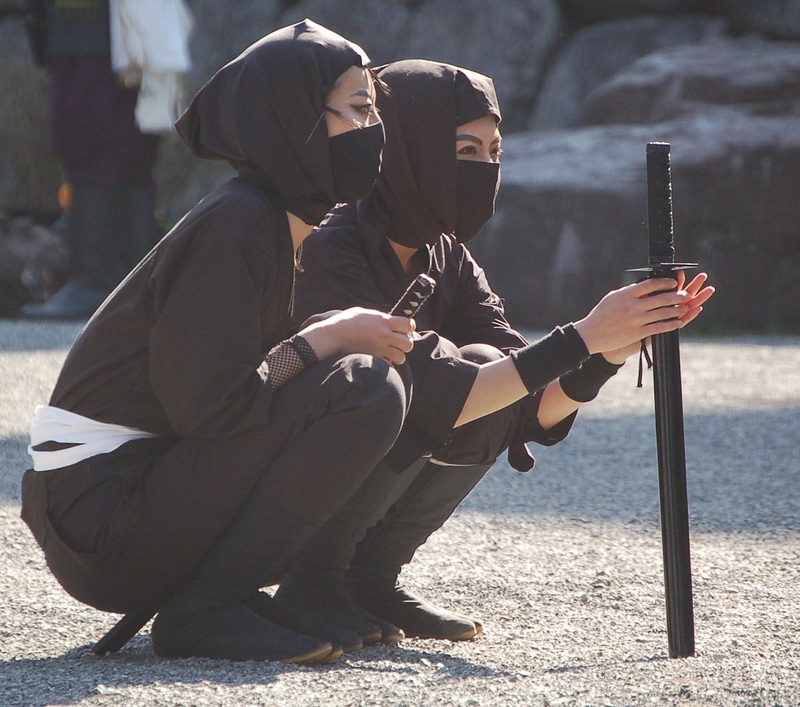 However, are the two crouching characters dressed in black, above, supposed to represent ninja, can someone tell me? Ninja really did exist; they were covert agents, spies and mercenaries, trained to be invisible and to be able to perform super-human feats. They’ve become the stuff of legend now, of course. I wonder what all these people look like on Monday morning. I put my washing out to dry before I left for work this morning. There’s nothing unusual about that but by lunchtime the sky was looking quite grey and I was told that we were going to have some bad weather later in the afternoon and evening. By early afternoon, I was told that the weather really was forecast to become bad. There was talk of having to leave the office early so that people could get home before the worst of the winds arrived. It was already windy and wet by the time I left at 3:00pm. Don’t worry, I was told, the Zuken mansion is strongly built. So, I got back to my apartment and brought my wet washing in; I wrung out some clothes that had been blown on to the floor of my balcony; I changed into some dry trousers and put the kettle on. The wind has been getting stronger all afternoon and my windows are rattling in the gusts. There’s a constant hum of the wind in the power cables that run past the Zuken mansion. The rain’s being blown horizontally and there’s no-one on the streets. It was also pretty windy at the weekend, windy enough for the trains to be disrupted on Saturday. I was told the term haru ichiban, literally “spring wind”. A more accurate translation of the meaning is “the first gale of spring”. Haru ichiban blows from the south, bringing warm winds; the wind this evening coming from the south, but there doesn’t seem to be anything warm and spring-like about it. I spent Sunday in Odawara with Nori and Emi and their family. The sun was shining, the sky was blue – but the sakura still wasn’t out. It’s on the verge of opening, and it has done so in some other parts of Japan, but I’m still waiting. There are avenues of trees, with a hint of pink from the closed buds, and you can tell it’s going to be good when it does come. Anyway, here’s a photo of Odawara Castle. The present-day building is a reconstruction; the first castle was built in the 15th century, and had a long history of being fought over by different families before being demolished in 1870. The castle itself and the gates that would once have protected it have all been restored since the 1930s. Inside the castle, there’s a collection of artefacts showing how people would have lived during the period in which the castle was in use. As you walk past the displays, you climb up and emerge onto an external walkway around an upper level. On one side is the sea; on the other side the high hills of Hakone. There were lots of visitors to the castle and the grounds on Sunday – a festival of some kind was being held. Stalls were selling food and there was a stage, and we watched some traditional Japanese drums being played. 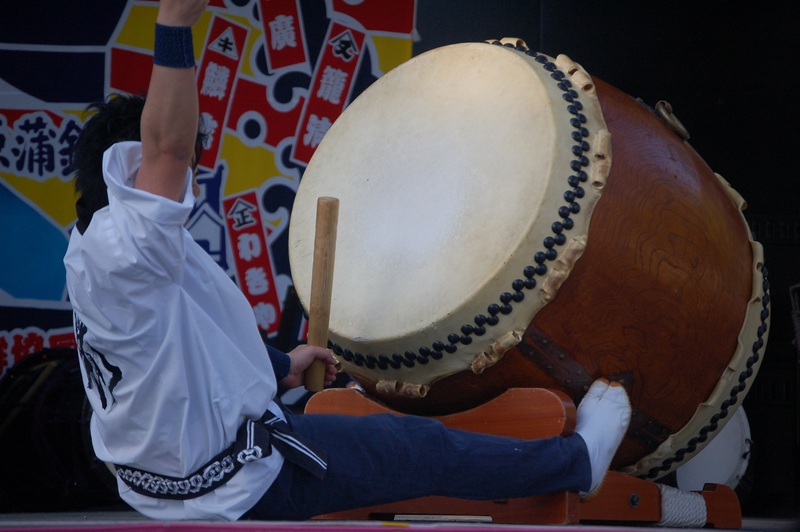 The biggest were made from a single piece of wood, and were being hit with as much force as the drummers could manage. The drum sticks were pretty hefty, designed for power rather than finesse. It was good to see and hear. The football season started recently and I went to see a J.League division 1 match at the Nissan Stadium last night. Yokohama F Marinos were playing Kashima Antlers. With a total of one draw and five losses between them in the league this season, both teams were at the wrong end of the table. I went with Kibe-san and Daishi-san, and from our seats we had the Antlers fans behind the goal to our left and the Marinos fans away to the right. The Marinos fans outnumbered the Antlers fans and were far more vocal in support of their team. In the first half, the Antlers had the better of the play but there were no clear cut chances at either end. It started to rain during the match and the second half was played in increasingly wet conditions. Still there were no clear chances. 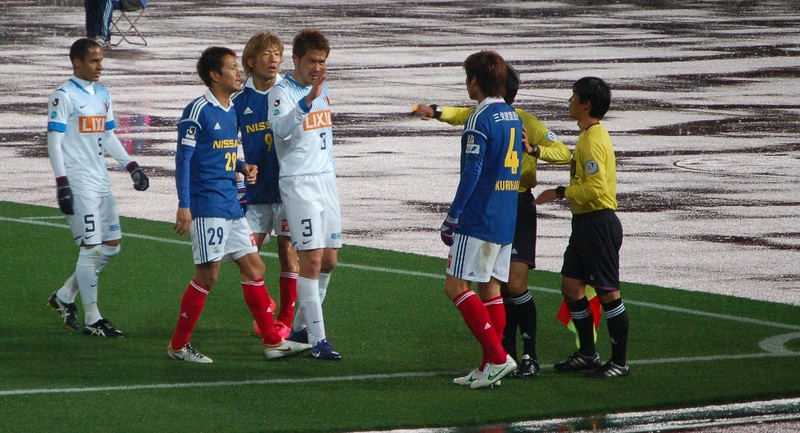 The photo on the right shows the exchanges of opinion following an incident wher e a high boot from an Antlers player appeared to make contact with the face of a Marinos player in the Antlers penalty area, but the referee and assistant referee weren’t interested in the Marinos appeals for justice. So, it ended 0-0 and we went off to warm up with a bowl of ramen. Here’s a link to a YouTube clip of the Marinos fans. It was just like that last night – the chant, the drums, the flags. Only the weather was different.